It’s hard to capture the colors accurately, but that’s reasonably close. It’s very comfortable and soft and squooshy. It ultimately came together pretty easily. I think it’s nice that the yarn I used (Rios) coordinates with the river theme in the title. 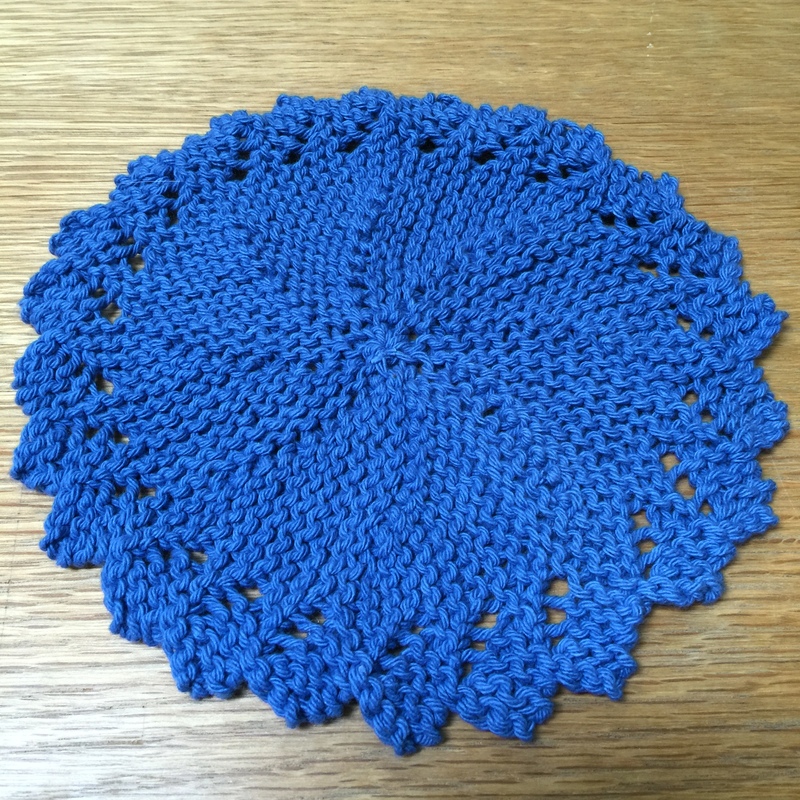 I finished my Blueberry Pie dishcloth yesterday and started using it a few minutes later. Surprisingly, the dye bled a lot when it hit the water. I’ve never had that happen with kitchen cotton before. It stopped after a few minutes of washing dishes in hot soapy water, but I want to remember that when I wash it the first couple of times. It’s been nice having it on the needles–it’s a quick knit, easy but not totally mindless, and it’s easily portable–so I just cast on another. Lastly, I cast on for a Summerskirt last night, too. 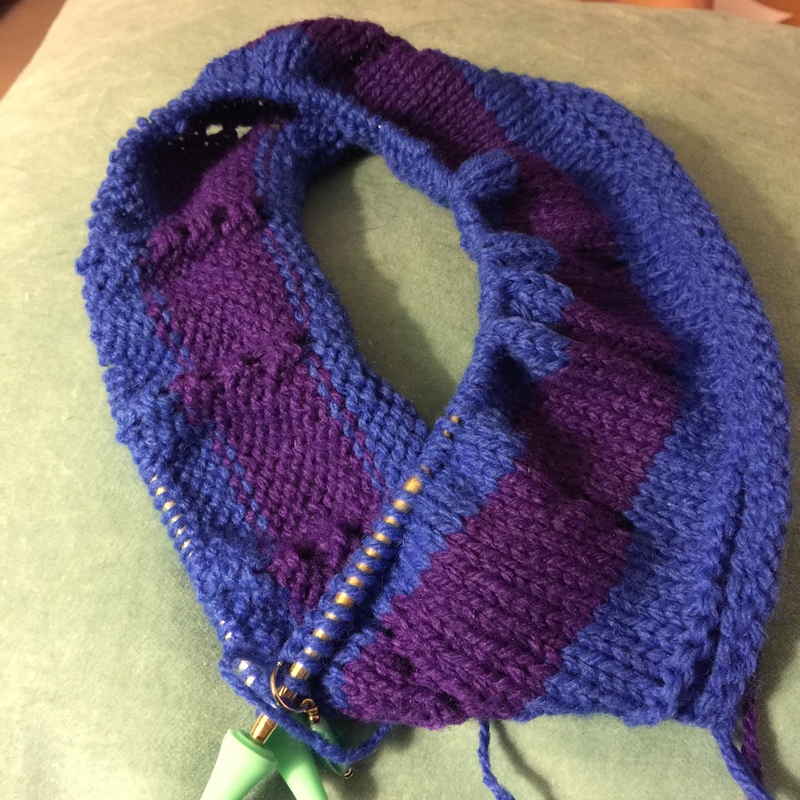 I’m using some stash yarn that was gifted to me–blue and purple Caron Glencannon Sport. It’s actually closer to DK weight but I’m ignoring that (the pattern calls for sport). It’s a wool/acrylic blend (not my usual fare, but useful in this case) so I’m thinking it will be good for fall and winter with with leggings. It should be a simple knit and wear very well, not to mention be easy to wash. My daughter is very much into twirly skirts right now, so I think she’ll like it. The pattern casts on at the waistband then continues down to the hem with lots of increases on the way. The original pattern calls for several designs made in purl stitch detail, but I’ve eliminated those in favor of a cleaner look. I’m also just using two colors alternating instead of seven. The chart on the pattern threw me for a loop initially. I haven’t done many charted patterns before. The ones I have done have mostly been cable patterns that use small charts accompanied by text directions. This one, the entire body of the skirt is charted. 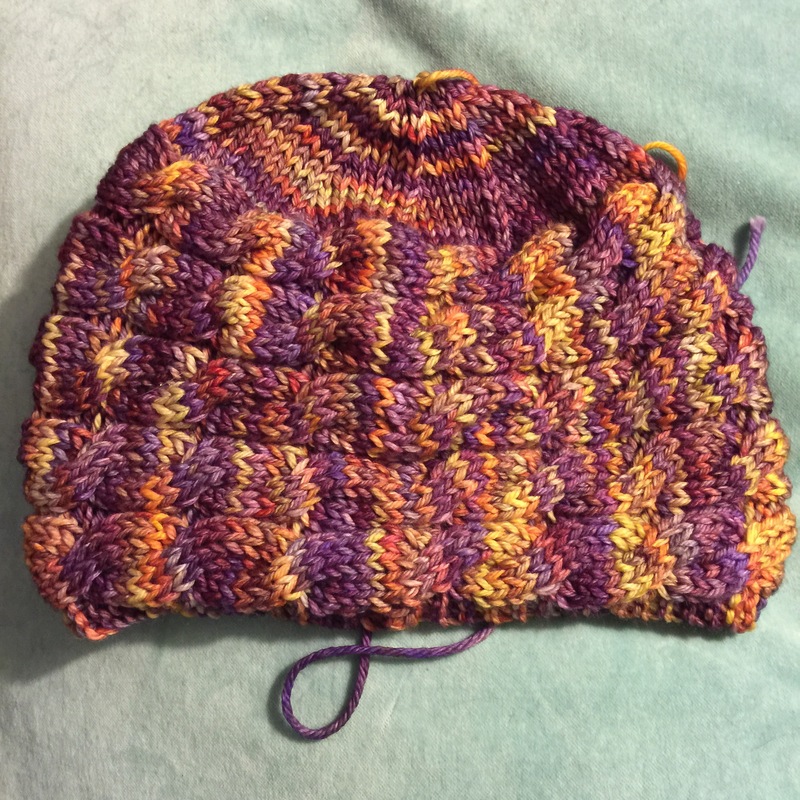 There’s a thread on ravelry that brings up some of the same questions I had, and piecing through that helped me understand it better. Basic idea is to start each round at the dotted line, read from right to left, and repeat areas between the bold lines. You will have a partial repeat at the start and end of each round. Ignore the leftmost column past the bold line–it’s meant to alert you to the next stitch up, not be a separate stitch outside of the repeats. Once you get going, it’s very easy but I had a little trouble figuring it out initially. It’s a lazy, grey day here today, so I’m hoping to get lots more knitting done. Soon I’ll be back to work and won’t have nearly as much time to knit as I have lately. I’m clinging to the time I have even more tenaciously knowing that my summer staycation will have to end soon!